Tako Loko (3248 Isleville Street) opened its doors last Wednesday to a hungry crowd of north enders. Keeping the menu simple, the 20-seat restaurant offers seven types of tacos: Chicken, carne asada (grilled steak), chorizo, carnitas de Puerco, suadero (brisket), fish and veggie. Customers can also choose between beans, rice, quesadilla and guacamole and chips. 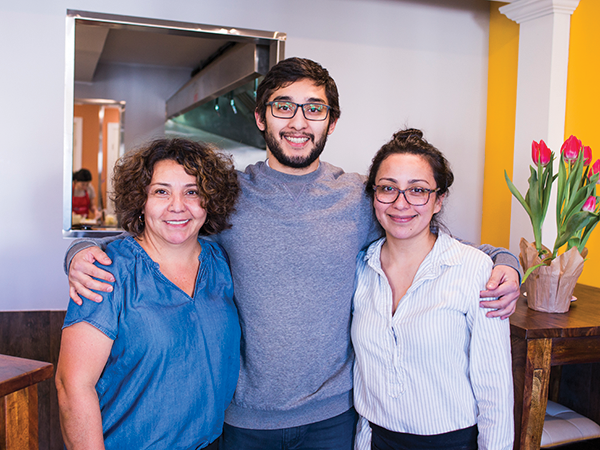 "This is my language, my meat, my flavours, my colours," owner Vicky Ruiz says. Tako Loko has labelled itself an authentic Mexican restaurant in order to let people know they won't find Tex-Mex tacos—you know, the ground beef, cheese, lettuce and sour cream kind—here. In Mexico, a taco is a soft corn tortilla with meat, onions, cilantro, lime and salsa. Ruiz and her children, José, Daniela and Enrique, moved to Halifax from Mexico more than 15 years ago. Minus a few exceptions, like Mexico Lindo in Fairview, they were hard-pressed to find restaurants that served the food they loved and missed. In an effort to make sure Tako Loko had a look as representative of Mexico as possible, she chose all of the restaurant’s vibrant colours and decorations. Green and yellow walls are adorned with a chalkboard menu and yellow coat hangers that look like garden spigots. Four lights are suspended from the ceiling with knotted hemp rope. On a shelf behind the cash, a rainbow donkey piñata relaxes – just out of reach. As we sit in the restaurant, four separate groups of people knock on the door. Each time, José tells them politely, "We open at five tonight." Apparently, this has become a common occurrence. Ruiz isn't sure how word has spread so quickly—she's already gone through 1,500 tortillas. She says several people have been by twice, and often stay for more than one round of food. Luckily, service is fast-paced as tacos are easy to prepare and quick to disappear. "This has been my dream for many, many years," Ruiz says.